The large L-shaped computer desk, containing a keyboard drawer and a CPU tower stand, not only provides ample space to carry out your work but also attaches unusually chic style to your usually daily life. 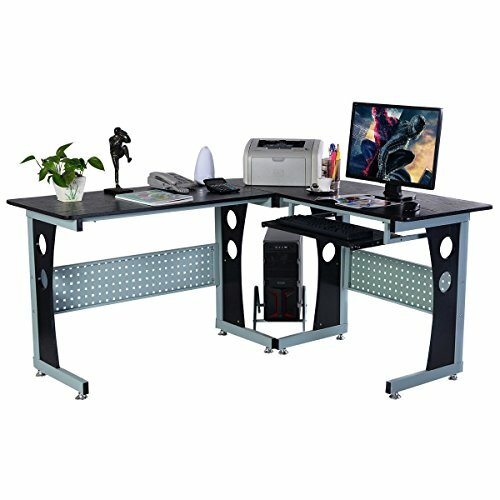 This PC table which features a smooth slide-out keyboard shelf and two generous size top, is large enough for you to deal with routine work. And you can also comfortably spread your workstation across the spacious surface as it's a full-size desk. The mdf board top provides years of sturdy, reliable use. Beneath the desk an additional platform is provided to support a computer tower, including a small drawer that rolls in and out to hold a computer keyboard. This desk will complete your home or office with its convenient design and chic look.